"It's kind of a new phenomenon," says Keith Koper, director of the University of Utah Seismograph Stations and co-author of the study. "We don't really know how it's created." "We've recently found that the waves on lakes actually generate these microseisms too," Koper says. 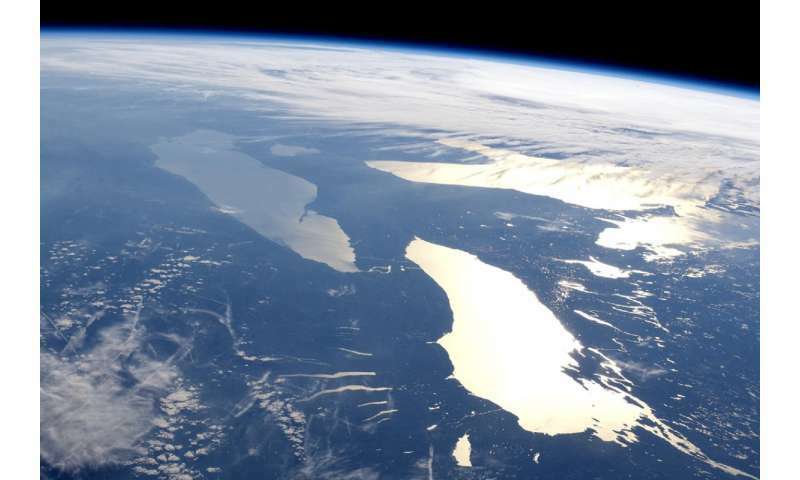 Lake microseisms had been previously recorded near the Great Lakes, Canada's Great Slave Lake and Utah's own Great Salt Lake. In the paper, Koper and colleagues present additional observations from Yellowstone Lake and three lakes in China, exploring the characteristics of the respective lakes' microseisms. Koper says the tremors are very small. "You wouldn't be able to feel 'em, that's for sure," he says. But by averaging seismic signals over a long period—six months, for example—a consistent signal emerges. The signal can be used to produce what Koper calls a "CT scan of the Earth," or seismic tomography. Seismic waves travel through different geological materials at different speeds, so observing how waves change as they emanate from a source can reveal subsurface geology. Researchers can create these seismic sources with methods like a hammer on a metal plate, an explosion, or a specially outfitted truck with a vibrating plate. Lakes, Koper says, provide a natural, regular source. "It would take quite a bit of effort and work to generate this level of energy." The area that could be explored using lake microseisms is limited to the region close to a lake, but Koper writes that lake microseisms emanating from the Great Salt Lake might reach far enough to visualize how seismic waves would move beneath Salt Lake City, which sits on the Wasatch Fault, in a major earthquake. Likewise, Lake Tahoe microseisms could extend to Reno, Nevada, and Lake Michigan could provide microseisms to image the geology beneath the Chicago area. Mokhdhari looked at microseismic data from Yellowstone Lake, a well-observed lake for which the freezing and thawing dates are known. "We compare the data we got from the seismograph to see if it's the same," she says. "So far it is." Seismological observations may not be needed at Yellowstone Lake, but could be useful for monitoring more remote lakes for long-term changes to ice cover duration. Mokhdhari will present results of her work on lake microseisms at the Fall Meeting of the American Geophysical Union, to be held Dec. 11-15 in New Orleans. Next summer, Mokhdhari and Koper will join colleagues in a further seismic study of Yellowstone Lake. They'll place an array of small seismometers called geophones around the perimeter of the lake, and also place an array of special waterproof seismometers on the lake floor. Additionally, they will use a buoy on the lake to measure wind and wave conditions. Their colleagues are looking to understand the hydrothermal vents in Yellowstone Lake, but Mokhdhari and Koper are much more interested in capturing microseisms from all angles. "If we can record at the same time on land and underwater," Koper says, "we can get a better idea of how these things are generated."